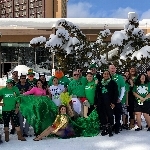 Join Deuel Vocational Institution Cold & Bold on March 30, 2019 as we “Plunge with a Purpose”- to encourage inclusion through sports and change the way that people think about and treat individuals with intellectual disabilities. Funds raised from the Sacramento Polar Plunge help us continue to generate change in our communities and enhance the lives of our athletes and their families. HELP US MEET OUR GOAL OF $25,000!!! It would benefit 250 Athletes!! !